In the 1930s, the C&O improved its railroad by boring new tunnels and enlarging others. The Class T-1 "Texas" type 2-10-4s also arrived in the early 1930s and seemed to be the choice for hauling its coal trains over the 80 miles of track from Hinton, WV east to Clifton Forge, VA. This run included a 13 mile .577% grade to the 2,072 foot summit of an Allegheny mountain and then a descent down a 1.14% grade to Clifton Forge. Its 2-6-6-2s were getting old and the 2-8-8-2s, delivered in the 1920s, (which used simple expansion because of tight tunnel clearances) were not up to the task. On the brink of ordering more 2-10-4s the C&O was approached by the Lima Locomotive Company with a new and more powerful locomotive design. 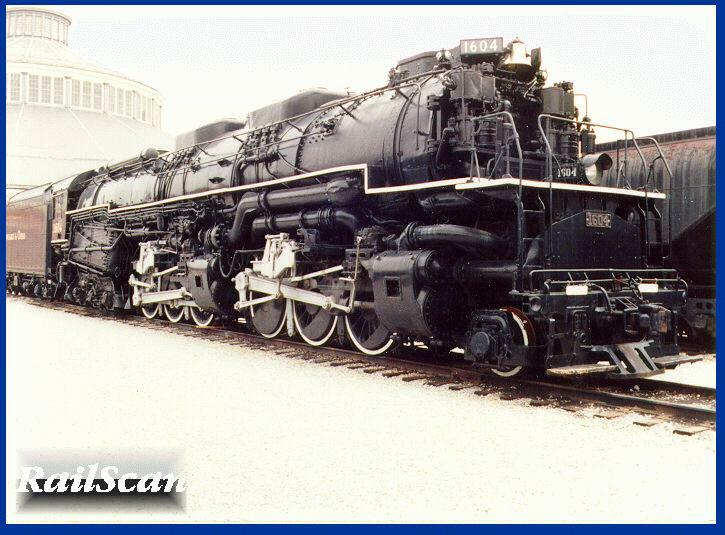 This design was a six-coupled, single-expansion articulated with 67" diameter drivers for speed, a 9' x 15' firebox with a very large boiler for steaming and 778,000 pounds of locomotive weight to assure tractive effort. The large fire box was placed behind the drivers and required a six-wheel trailing truck to support it. This gave the design a wheel arrangement of 2-6-6-6. With four 22.5" diameter x 33" stroke cylinders, a 260 psi boiler pressure and the 67" diameter drivers it could exert 110,200 pounds of tractive effort. 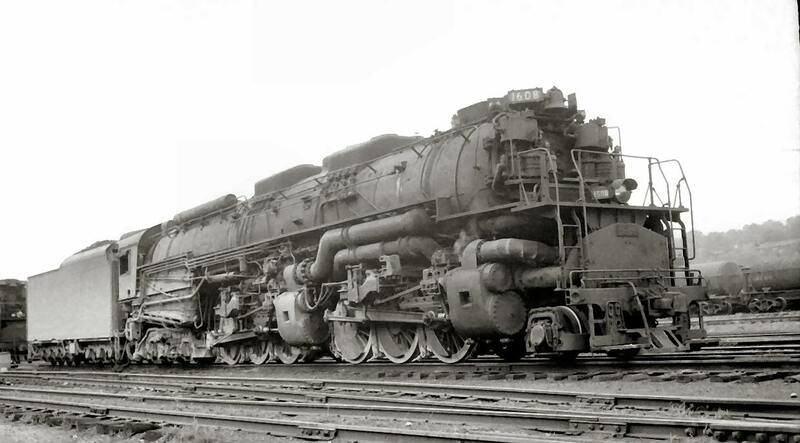 The C&O agreed and placed an order for ten of these 2-6-6-6 locomotives and Lima delivered them in December, 1941. They were designated Class H-8 and assigned road numbers 1600 through 1609. With a new wheel arrangement came a new name. The C&O selected the name "Allegheny" for the mountain range that this new locomotive would do its work. An article by King in "Trains" in the early 2000s stated that the C&O Alleghenies cost around $230,000 each. The tenders for these new locomotives were of the largest type used on the C&O, with a 25,000 gallon water tank and a 25 ton coal bunker. In order to keep the overall length of the locomotive and tender within the limit that existing turntables could handle it was necessary to make the rear section of the tender higher, thus causing more weight to be at the rear than the front. The tender had a six-wheel leading truck, but an eight-wheel trailing truck was needed to carry the weight in the rear. In operation, one "Allegheny" leading and one pushing could move a 140 car loaded coal train up the mountain from the Hinton terminal. At the top the pusher would be taken off, turned around and sent back to the Hinton terminal. The single leading "Allegheny" could handle the decent down the mountain to Clifton Forge where it would be turned around for a return trip with a train of empty coal cars. The C&O had 23 of its "Alleghenies" equipped with steam heat and signal lines for passenger service, but they were used sparingly, pulling an occasional heavy mail train or a troop train during World War II. The "Allegheny" may have been the ultimate freight locomotive. They were able to achieve a very impressive record even though they were used in a manner that didn't fit perfectly with their design. The Allegheny boilers were capable of delivering up to 8000 HP! This was far greater than any other reciprocating steam locomotive could develop. However, the C&O used the H-8s in "coal drag" service where they were unable to realize their full potential as high speed locomotives. The C&O Alleghenies were designed to haul 5,000 tons at 45mph, but unfortunately were used to haul trains of 10,000 or more tons at 15mph. C&O's 2-6-6-6s were very impressive locomotives. However, they were never used to their full potential. The "Allegheny" was truly magnificent in its role, but as good as it was it could not win the battle with the diesel. The C&O's "Alleghenies" were taken out of service beginning in 1952 with the last fire dropped in 1956. It should also be noted that the Alleghenies were some of the most powerful steam locomotives ever built. At 40 MPH they could generate 7,500 HP. This power was only exceeded by the PRR Q-2 Class (7,987HP). By contrast the UP Big Boy could generate a maximum of 6,200 drawbar HP. Fortunately, two of the C&O "Allegheny" type locomotives survive today, number 1601 at the Henry Ford Museum in Dearborn, MI and number 1604 at the B&O Railroad Museum in Baltimore, MD. Numbers 1600, 1602, 1603 and 1605-1659 were scrapped between 1952 and 1956. There has been substantial controversy about discrepancies on the actual weight of the Alleghenies. Various sources will list different engine weights and weight on drivers for the H-8s. The discrepancies were in part due to the design weight as specified by the C&O and then subsequent design changes submitted by the C&O. For example, while the locomotives were being built, the C&O suggested four different design changes of the connecting rods. Each of the changes resulted in increased locomotive weight. I've tried to make sense of the various weights that have been reported for these locomotives (the first batch). I don't know if we'll ever know the true weight. What I can say is that it was roughly equal to that of the UP Big Boys. See the table below that shows where some of the reported weights and their source. Data above from Locomotive Cyclopedias 1947 and 1952, amended and corrected by C&O 4 -1947 Locomotive Diagrams supplied in May 2005 by Allen Stanley from his extensive Rail Data Exchange. Built in several batches: 1600-1609 in 1941 (works numbers 7820-7823 in December 1941, 7824-7829 in January 1942), 1610-1619 in 1942 (works numbers 7883-7892 in September), and 1620-1644 in 1944 (works number 8613-8622 in July, 8799-8813 in October-November). The 1948 locomotives--1645-1659--were copies of the Virginian's AGs (Locobase 421), which had less heating surface and were a bit lighter; see Locobase 11065. Firebox had three syphons and arch tubes combining for 162 sq ft (15.05 sq m) of heating surface as well as a huge combustion chamber. Each cylinder was served by a 12" (306 mm) piston valve. All engine and tender axles turned inside Timken roller bearings. A Worthington Type 6 1/2 SA feed water heater raised the temperature of incoming boiler water. H-8s could operate 11,500-ton coal trains at speeds up to 45 mph (72.5 km/h). Probably the heaviest twelve-axle locomotives ever built, with certainly the highest axle load ever put on rails. Average axle load was 84,650 lb (38,397 kg) and the first driving axle bore 86,700 lb (39,327 kg). C&O Power gives higher weight on drivers (507,900 lb for the first batch, 504,010 lb for the 1948 engines), and heavier engine weights (771,300 lb and 751,830 lb, respectively.) The answer is that Cyclopedia weights were as designed, which specified 471,000 lb on the drivers, 724,500 for the engine. C&O Power weights came from C&O drawings. Bob Quehl (EMail:rquehl@adelphia.net) from Pittsburgh, PA offered considerable detail on the difference as well as other information ( Feb 4 2000, 4:06) " In the December 1998 issue of Trains Magazine there is a very interesting article that suggests the first 10 H-8s delivered in December 1941 to January 1942 weighed actually weighed in the area of 775,330 lbs in "working order". This was just the engine weight including water in the boiler, 12,000 lbs of sand in the domes an a two man engine crew. This is interesting because the specifications for the order between the C&O and Lima called for a weight of 726,000 lbs." Quehl implies that it was the Virginian's order of eight in 1945 that finally exposed the disparity. "One engineer at Lima gave the H-8's weight as high as 778,200 lbs. For the engine and tender combined weight I have seen several references in other sources around 1,200,000 lbs." There are many (including Eugene Huddleston and Thomas Dixon, Jr in their book Allegheny: Lima's Finest) who contend that C & O's oversight of the design by its Advisory Mechanical Committee contributed mightily to the problem. One example cited is four different changes to the design of the connecting rods, each of which made them heavier. According to Huddleston and Dixon, Lima later paid the C&O a $3 million penalty for missing the weight targets by so wide a margin. But did the C & O get what it paid for, whatever the cost in weight? It appears so, although the coal traffic they served didn't require the Challenger-like 67" drivers and massive tenders that this class deployed. To cope with an adverse grade of about 0.6%, the C & O would marshal 100 loaded coal cars, place one H-8 at the front and one at the rear and put the whole thing in motion. Once the train crested the summit, the pusher would drop off and the front H-8 would manage the train by itself. 23 were equipped for passenger operation, but if they were so used, it was to pull troop trains. Data above from Locomotive Cyclopedia 1947, amended and corrected by C&O 4 -1947 Locomotive Diagrams supplied in May 2005 by Allen Stanley from his extensive Rail Data Exchange. (Thanks to Chris Hohl for his 16 April 2017 email reporting the greater water capacity of the last H-8 tender.) Works numbers were 9390-9323 in December 1948. See Locobase 304 for comments on the serious weight miscalculation in the original H-8 design. When adding to the stud, the C & O adopted the smaller design sold to the Virginian in 1945 (Locobase 421). The big change from the 1941 Alleghenies was a 21% cut in the number of flues for the Type E superheater, which was only partially offset by an increase in the 2 1/4" tubes of 10. Firebox had three syphons and arch tubes combining for 162 sq ft (15.05 sq m) of heating surface as well as a huge combustion chamber. Could operate 11,500-ton coal trains at speeds up to 45 mph (72 kph). 1601 was retired in June, 1956. 1601 arrived at the Henry Ford Museum in July, 1956. It was brought to the museum "cold" at the rear of a C&O freight train. It was displayed outside with the DeWitt Clinton in Greenfield Village. When 1601 was moved indoors, it took three attempts to get it into the museum building. During the first attempt, 1601 derailed outside the building. Its main rods were removed. On the second attempt the swing of the cab, as the locomotive encountered a turnout inside the display hall, was greater than anticipated. Even though the doors had been widened, 1604 still wouldn't clear the doorway. Parts of 1601 had were temporarily removed. The third attempt succeeded. 1604 was retired in June, 1956. It was donated to the Roanoke Transportation Museum circa 1969. At Roanoke, 1604 was displayed next to N&W 1218. On November 4th, 1985, it was partially damaged in a flood (N&W 1218 was gone by this time). During that flood, it almost turned over when the ground was washed out from under it! Fortunately, it leaning up against an overhead bridge pier which prevented it from falling any further. The NS did a cosmetic overhaul on 1604 at the Roanoke Shops before for it was sent (around 1986) to Baltimore to be displayed as the centerpiece of the Mt. Clare Junction shopping center which was adjacent to the B&O Museum. The shopping center was literally built around 1604. 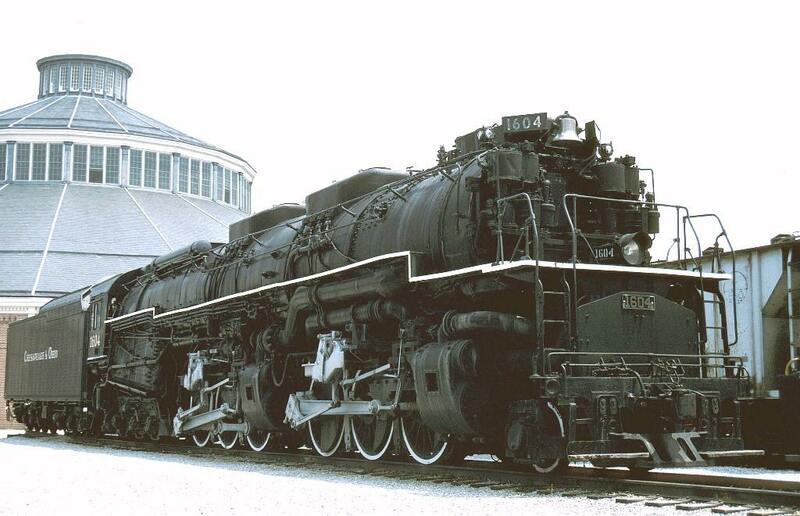 In 1989, the failing shopping center decided that 1604 was too big and decided to donate her to the B&O Museum. 1604 was moved from the mall onto B&O Museum property in early 1990 by SW-1 Pere Marquette 11. It was put on display outside the roundhouse. During the early 1990s, there was a rumor going around that the CSXT was considering starting their own steam excursion program. They reportedly sent some mechanics to check the condition of 1604 to see if it was feasible to restore it to operating condition! Apparently, those plans never came to fruition. Today, 1604 is displayed indoors. The cab has been cosmetically restored and lighting has been placed in the firebox so that it can be viewed.